…as they were watching, [Jesus] was lifted up, and a cloud took him out of their sight. 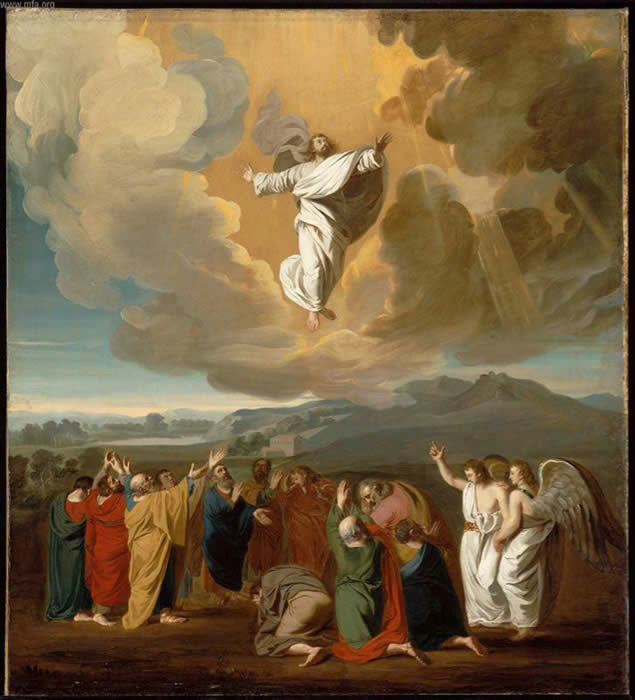 The first time I preached a sermon on the Ascension of our Lord was ten years ago, on May 5, 2005. The ministerial association that I was a part of held an ecumenical Ascension service each year and the preaching assignment was usually given to the least experienced preacher, which happened to be me. It was an evening service and in case you didn’t catch the date, it was also Cinco de Mayo. As you can imagine, there were not only more people in bars than were in church on that festive evening, but there were more clergy in the service than there were worshippers in the pews. Eventually, that ecumenical celebration was discontinued and, you might add, with good reason. I can assure you that today there are very few congregations that will celebrate the Ascension of Our Lord with worship. * Some will observe the Ascension this coming Sunday, bumping the seventh Sunday of Easter from the calendar. But I suspect that most will simply not observe it at all. When you consider that the writer of the gospel of Luke and the book of Acts thought this event worthy of narrating twice, this lack of observance of this great ecumenical feast gets shoddy treatment. It wasn’t always this way. The ascension of our Lord Jesus Christ was once celebrated universally and dramatically. According to the website, ascensionday.org, some churches had special holes in their roofs that were used on Ascension Day; when the words were read – “While he was blessing them, he withdrew from them and was carried up into heaven.” – a likeness of the risen Lord would be hauled up from the floor of the nave to and through the roof and out of sight of the people worshiping below. The same hole was used on the Day of Pentecost when, in some of these same churches, roses were showered down from above to symbolize the tongues of fire that “rested on each one of them” on the first Pentecost. I would not, by the way, campaign for a revival of the medieval practice of lifting a statue of the Lord up and through the roof. Building property committees would obviously look down on the idea ( both literally and figuratively speaking) and any pastor who would suggest such an architectural adjustment would most likely find him or herself preaching somewhere else the next Sunday. But the bottom line is that today, we do very little if anything at all. We don’t quite know how to celebrate the Ascension. This stands in stark contrast to the Amish communities in North America, who typically mark the day by closing their businesses and not doing field work, focusing instead on family gatherings and reunions. For the rest of American society, however, it is just another day. Perhaps we just can’t tolerate too much worship spilling into the week. Perhaps the scene of Jesus ascending on a cloud is a bit too reminiscent of Peter Pan or Mary Poppins with her umbrella. Yet week after week, on Sunday after Sunday or whenever we gather, we recite the words of either the Apostle’s Creed or the Nicene Creed and we repeat the line, “He ascended into heaven.” It rolls off our lips with little difficulty and I would guess, with little thought given to the meaning of those words. What does it mean to you that Jesus ascended into heaven? As humans, we are visual thinkers. Words help us create images that we remember even though we have seen them only in art or in our mind’s eye. We think of heaven as another place, an upper level on our three story universe. But unless we reframe our thinking, our mental elevator will always remain stuck on the ground floor. I would propose to you, however, that we don’t need to look to the heavens to find inspiration. The ever-present God is right here, giving us all the guidance and inspiration we need. And that guidance and inspiration can be found in Holy Scripture. God’s word in Holy Scripture points us in the right direction—beyond ourselves. In the assigned Gospel reading for Ascension Day, Luke 24:44–53, verse 45 reads: Then he opened their minds to understand the scriptures. He opened their minds to understand the scriptures. There is something liberating in this statement. Our minds must be open to understand, not closed. Reading the Bible with open minds reveals something new each time we read a passage. This is one of the things I used to stress when I was in the parish to the point that I believe some cringed when I would mention it. *There are two Ascension Day services in the Northeastern Ohio Synod that I am aware of. Both are at 7:00 p.m. Some of our most beautiful hymns are designated for Ascension Day. I will miss the worship service and singing them lustily. If you are looking for a service, try Messiah in Fairview Park. Were it not for the fact that I have synod assembly beginning tomorrow, that’s where I would be. Blessings to you and Bob! Christ the King Lutheran Church in Twinsburg will also have a service tonight at 7 pm on Ascension Day. All are welcome! First Lutheran in Lorain held a joint Ascension Day service with the Episcopal Church of the Redeemer on Thursday at 7 PM. For those congregations whose services I failed to mention, my apologies. Once our new website is active, we’ll be able to feature those special services in a more prominent way.